Guide - uBlock - A Fast and Efficient Ad Blocker. Easy on CPU and Memory. 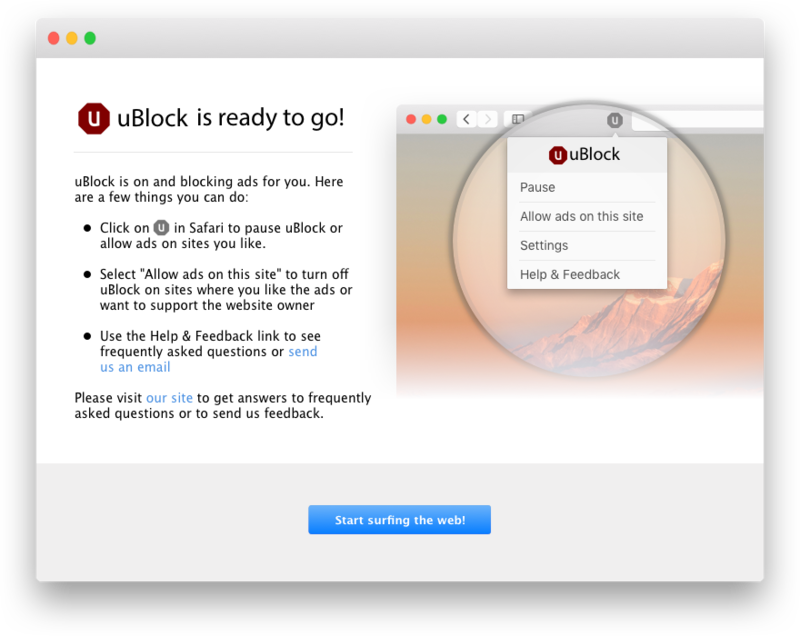 uBlock is a Mac app for the Safari browser that speeds up your browsing by blocking ads that clutter web pages. uBlock starts working as soon as you install it. 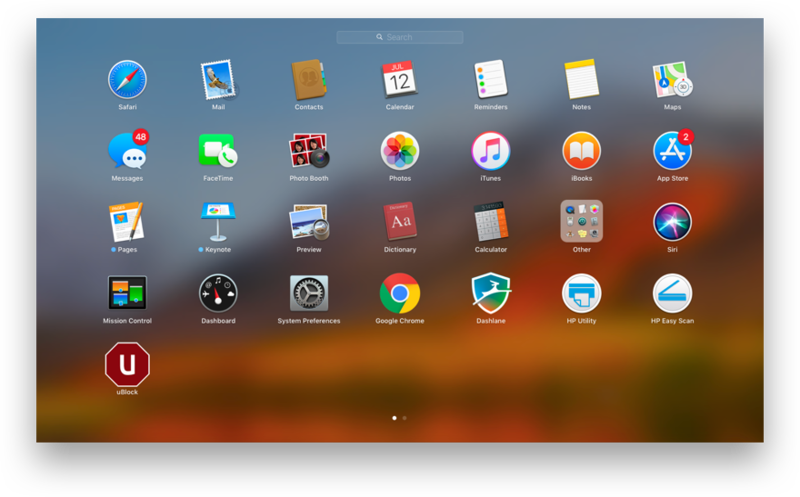 In this article, you’ll learn how to install uBlock on your Mac. uBlock is a Safari extension that blocks unwanted ads on web pages. 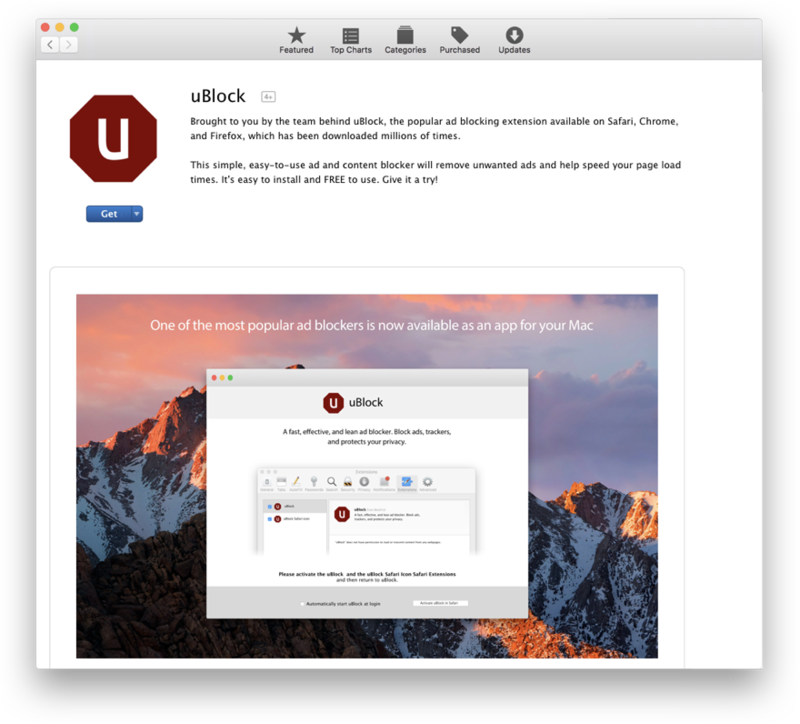 You can get uBlock from the Mac app store or our website, www.ublock.org. The uBlock desktop app, which contains the sets of rules, or filter lists, that uBlock uses to determine what to block on which sites. Both are required for uBlock to work. 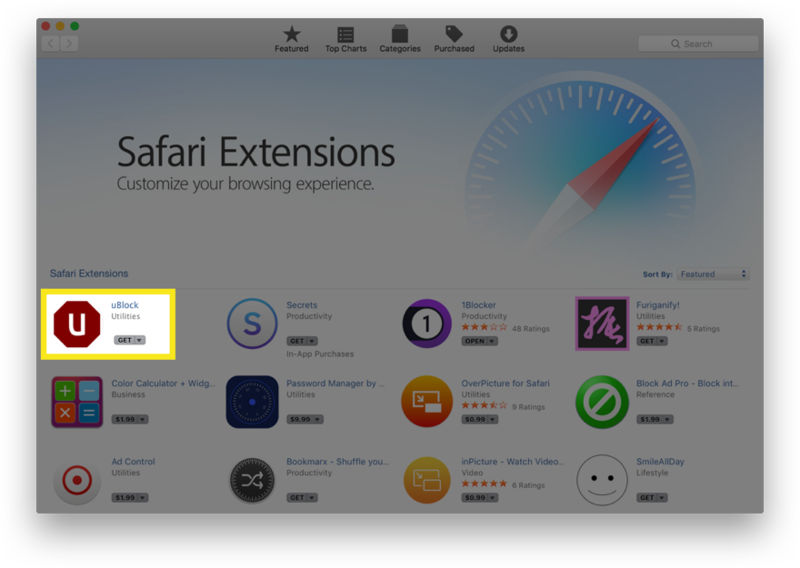 When you install uBlock, be sure to turn on both the app and the extension in Safari Extensions preferences. Find uBlock in the Mac app store. Click Activate uBlock in Safari. If you want uBlock to start when you open Safari, also select Automatically start uBlock at login. Select both uBlock Safari icon and uBlock. Note: It is very important that you select both uBlock Safari icon and uBlock. If you don’t select both, uBlock will not block ads properly and you will not be able to control the app from within Safari. Click Start Surfing the Web. uBlock is now set up to block annoying ads on every web page you visit. Learn how you can customize how and where uBlock works. uBlock is a fast but powerful tool to help you block annoying ads and speed up your browsing in Safari. uBlock starts blocking ads on millions of websites, including Facebook, YouTube, and Spotify, from the moment it’s installed. You can pause uBlock, allowing ads to appear temporarily when needed, or turn it off entirely on sites where you want to allow ads every time you visit. You can also make sure your filter lists are up-to-date if an ad slips past uBlock. This article will show you how. If you haven’t installed uBlock yet, do that now. Let’s look at what you can do in each component. 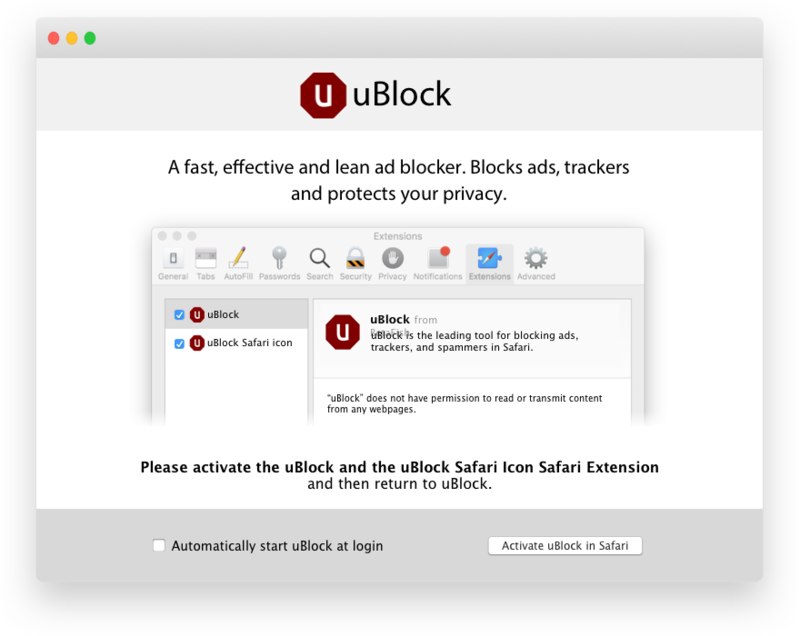 The uBlock desktop app allows you to select which ads are blocked and on which sites. It also allows you to manually update the filter rules it uses to block ads. Click the uBlock icon in the MacOS Launcher. The app window has two tabs, Filter Lists and Whitelisting. The Filter Lists tab is where you can control uBlock’s filter list settings. When you install uBlock, both Hide ads and Allow some non-intrusive ads are already selected for you. Here’s what happens if you change these settings. Hide ads controls uBlock’s ad-blocking filter lists. Clearing this setting turns them off. Always leave this selected, or uBlock will not block any ads anywhere. Allow some non-intrusive ads controls the “Acceptable Ads” filter list. If you prefer not to see text ads in search results and other non-intrusive ads that help websites stay in business, clear this setting. Learn more about Acceptable Ads. uBlock’s filter lists update themselves automatically as long as Chrome is open. uBlock also fetches updates every time you start Chrome. Websites change their ads often, however, and it can be a day or so before the filter lists catch up. If you start seeing ads that should be blocked, it might be because uBlock’s copy of the filter lists is older than the ads. A good first step in troubleshooting is a manual update, especially if you see that the last update was more than a day ago. To make sure uBlock has the latest filters, click Update Filter Lists Now. The Acceptable Ads filter list allows non-intrusive ads to appear on any website. You can allow ads to appear on websites you choose, too, if you like the site and don’t mind the ads it serves. Allowing ads is known as whitelisting. Sites that you whitelist are separate from ads that are whitelisted by the Acceptable Ads filter list. That is, if you whitelist a site, you may see ads that don’t meet the Acceptable Ads criteria. Learn more about what makes an ad acceptable or not. To allow ads on a specific website, enter its domain name and click Add Website. You can also easily whitelist websites on the fly, without entering a domain name, using the uBlock extension. 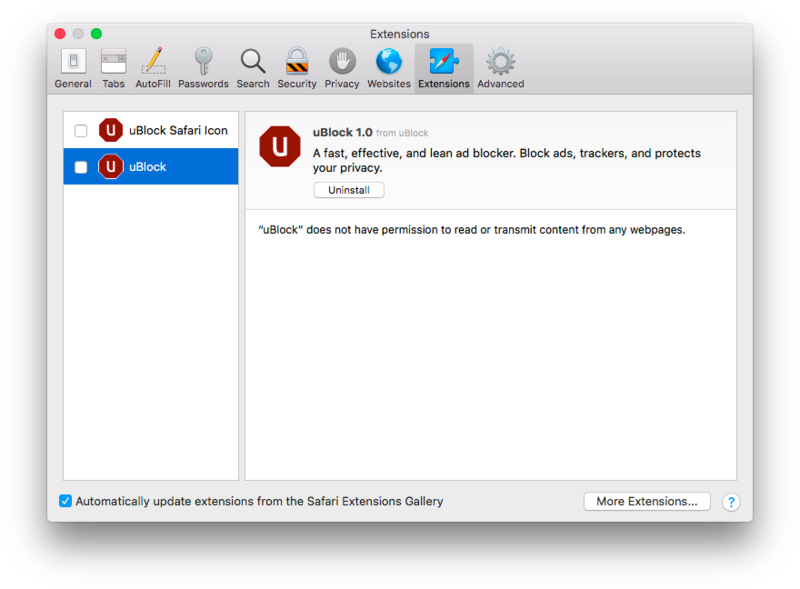 The uBlock extension allows you to control uBlock from within Safari. You can use the uBlock icon on the Safari toolbar to pause uBlock temporarily, easily whitelist sites without entering their domain name, change uBlock’s settings, find answers to questions, and contact uBlock Support. Click the uBlock icon in the Safari toolbar. To turn off uBlock while browsing, select Pause and reload the page. This is a good first step in troubleshooting when a page doesn’t seem to work with uBlock on. It may also be necessary when you visit a site that doesn’t allow ad blockers. To start blocking ads again, select Resume and reload the page. If you like a website and don’t mind the ads it serves, select Allow ads on this site to tell uBlock never to run on the website you’re visiting. This is an alternate method to whitelisting a site in the uBlock app. 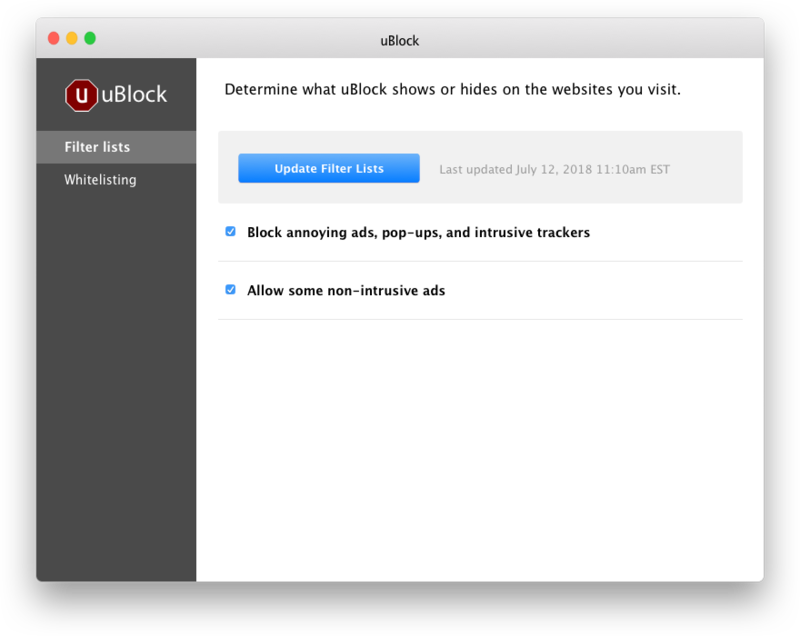 Select Settings to open the uBlock desktop app, where you can opt into or out of allowing non-intrusive ads, update uBlock’s filter lists, and add and remove websites from your whitelist. Select Help & Feedback to visit the uBlock support site, where you can find answers to common questions and email the uBlock support team. The internet is being overrun with ads. And while ads are not necessarily bad on their own, many ads can have negative implications for security as well as the performance of your computer or mobile phone. uBlock was created to give users control over which ads they see, what content they want to block, and how they want their internet experience to work. uBlock is easy to use and very powerful. There are versions of uBlock currently available for Chrome, Firefox, Safari, and as a Mac app for many Apple computers. uBlock is open source software designed to give users the ability to take back control of their browser and to have a say in how their personal information is gathered and distributed online. uBlock is supported by a small team of developers that rely on your support to continue development of a product used by millions of people worldwide.